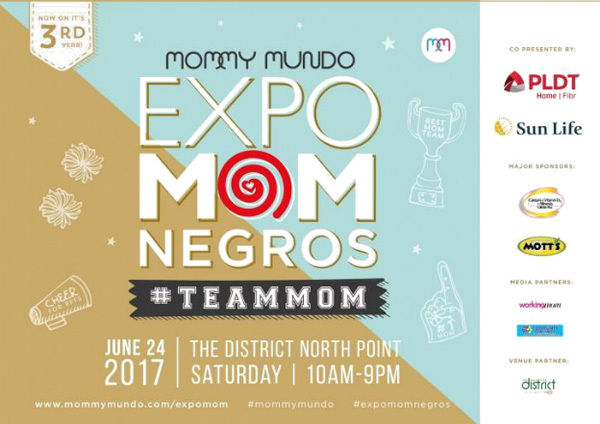 ExpoMom Negros by Mommy Mundo is happening on Saturday, June 24, 2017 at The District North Point. That’s the battle cry of moms after realizing that amidst the multitude of issues and concerns that come with motherhood, every load becomes lighter when you share it with another. When a mom has a group of other mothers behind her, the business of taking care of everyday issues just seems easier. She knows that she as an ear that would listen to her worries, a smile that would brighten up her mood, and a hand that would hurry along the accomplishment of important tasks. In celebration of its 10th year anniversary, Expo Mom by Mommy Mundo pays tribute to the strong #TeamMoms all over the country. Expo Mom #TeamMom 2017 was kicked off this year with a three-day event at the Glorietta Activity Center last May. And this month of June, Expo Mom #TeamMom went on a nationwide roadshow that started off at the Ayala Center Cebu last June 17, 2017. And this Saturday, June 24, 2017, they are coming to The District North Point in Talisay, Negros Occidental, to celebrate with #TeamMoms in Negros. Expo Mom #TeamMom brings the most modern mommy and baby products and services as well as parenting trends, mommy solutions, and inspiring advocacies to the mommies in Negros. The Negros leg will feature local #TeamMoms who have supported each other in their motherhood journey. Among others, there will be #TeamMoms of homeschooling and breastfeeding mommas. #homeschoolinginBacolod My wife, Sigrid Says, along with two other homeschooling moms, Laksmi Flores and Tracy Divinagracia, will guest in the affair. Expo Mom’s tenth year anniversary also includes celebrations and an exciting Grand Giveaway. Moms can share their #TeamMom story on social media, and get the chance to win for some awesome prizes for the whole team, which include a trip for 4 to Taipei. Click this link for more details. Expo Mom is the banner event of Mommy Mundo, a community of moms dedicated to making motherhood easier, happier, and more fulfilling for every Filipino mom. Mommy Mundo is your ultimate #TeamMom. Through its carefully curated selection of events and activities, Mommy Mundo has given valuable support and encouragement to moms all over the country. Among the areas covered are healthy pregnancy, breastfeeding, active parenting, as well as mompreneurship. Next Next post: Honey, I Shrunk the Wedding Ring!